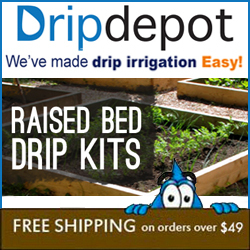 Fun and Unique Gardening Tee Shirts and More! During this time of year, I don't get to work in the garden at all. Saturday morning's temperature got down to -8 degrees Fahrenheit! Most people don't think much about gardening in the Winter but I think about gardening MORE when I can't get out there much. 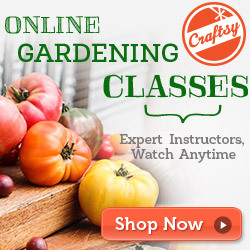 To get my fix, I spend a lot of time on the internet looking at seed companies and garden product company websites. I'm always looking for the next great product like Great Big Plants or the Table Top Gardener that will make my life easier. 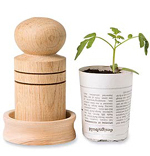 I also look at stores and online for "fun" gardening items like The Eye Grow or the Topsy Turvy Tomato Planter. This is the category that I'm about to add to. These are from CafePress , who has thousands of items covering all sorts of interests and hobbies. I'm just glad one of those interests is gardening. My Office shirt because it really fits my Garden Desk theme! I like this better because I can wear it even more often than the shirt. If I get this I'll be in my office Cap , then I can get the heirloom tomato shirt. The problem with looking at a store for too long however, is that the longer you look, the more likely you will find something else you want! They have more than one heirloom tomato shirt! Which one should I get?! It was fun looking through all of the selections at CafePress . The only complaint I might have is that the searching is a bit difficult. The items are organized more by the artist or supplier of the shirts than by category. It took a lot of searching different terms to come up with what I was looking for. If you are looking for something in particular, don't give up too soon. They even have gardening shirts for little kids. If you, or someone you know are particular about your lawn and how the grass is cut, then CafePress has some pretty funny shirts for you. There are even items for all the sub-categories of gardening that I enjoy, like pumpkin growing and worm composting! There are so many selections that I could go on all day! I have to stop somewhere though. If this sort of thing interests you, I recommend you look around at CafePress a little. I know I had fun on their site. I will leave you with this humorous look at both sides of the vegetarian debate. Remember, All CafePress T-Shirts are 20% off now until March 3rd! EDIT: I did order the first Heirloom Tomato Gardener shirt! You can see me wearing it Here!